The park was established on land grabbed from local communities after they were misled by officials on the project and its impact. The project has resulted in human rights abuses, pollution and health hazards, misspent public funds, charges of embezzlement and corruption, and legal disputes. 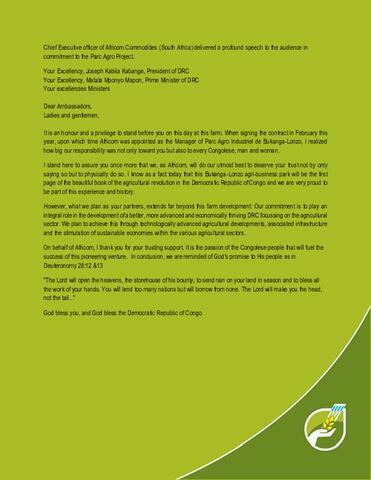 The World Bank and the African Development Bank are the key drivers, designers, and financers of agro-industrial parks in DRC even though these parks go against the interests of the country, DRC’s own agricultural policy, and the will of farmers and their organizations. Oakland, CA—The establishment and collapse of the Bukanga Lonzo agro-industrial park pilot in the Democratic Republic of Congo (DRC) has resulted in numerous land rights violations and human rights abuses, pollution and health hazards, misspent funds, charges of embezzlement and corruption, and legal action, according to a new report, The Bukanga Lonzo Debacle by the Oakland Institute. 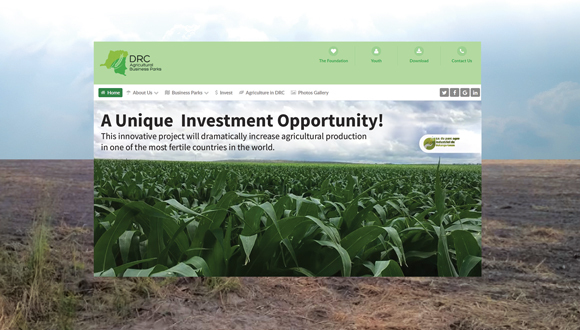 The report’s extensive research on the project and its impact reveals that agro-industrial parks are a false solution to the challenges faced by DRC and Africa when it comes to food, agriculture, and poverty alleviation. “The DRC government must give up the ill-conceived plan to offer people’s land to foreign firms so they can set up agro-industrial parks. This is not an effective and sustainable way to fight hunger and poverty,” said Oakland Institute Policy Director Frédéric Mousseau, author of the report. The Bukanga Lonzo agro-industrial park was set up in 2014 through a public-private partnership between the government and a South African company, Africom Commodities. It was to use 80,000 hectares of land for the production of corn and other commodities. The state spent close to US$100 million of public money on the project. However, three years after it was launched, the project collapsed in 2017. Africom blamed high costs and the unreliability of the government’s plans and payment, and launched a court action in July 2018 against DRC for non-payment of expenses. The DRC government blames Africom for the failure. 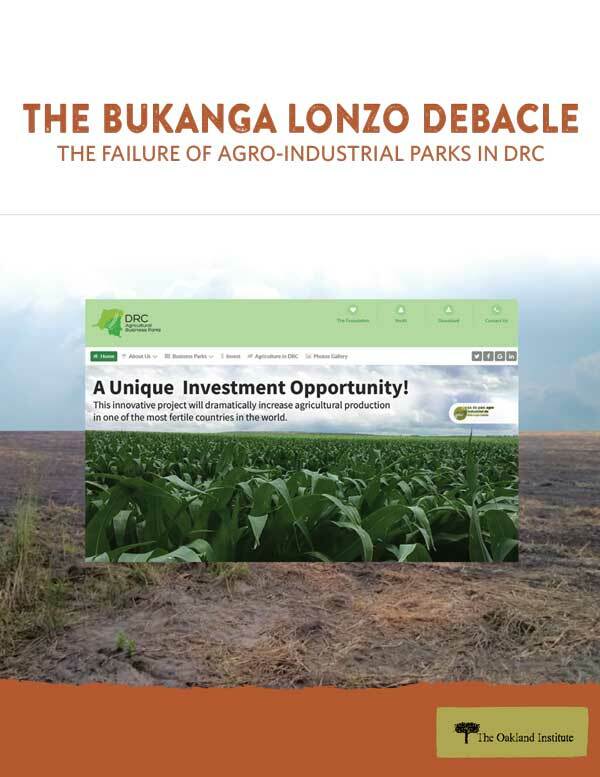 “The Bukanga Lonzo Debacle exposes numerous issues with the park. The land used for the park was grabbed from the locals, who were misled into signing documents that gave away their land – in violation of land rights and national laws,” said Matthieu Yela Bonketo, Co-ordinator of the Congolese NGO Cercle pour la défense de l'environnement (CEDEN). Local villagers report that the establishment of the park resulted in violence and human rights abuses by police forces, allegedly leading to at least one death. The project also acquired large quantities of harmful chemicals including 60,000 liters of glyphosate, resulting in serious threats to locals’ health and the natural resources on which they depend for their livelihoods. A puzzling finding of the research is the creation of a mining company in 2015 using the cover of the park, which, far from the claimed food security goal of the project, was created for prospecting and exploiting minerals. A leaked audit analyzed in the report reveals all sorts of financial mismanagement by the South African company and raises suspicions of embezzlement and corruption. The research identifies further issues of poor management, including crops being left to rot and the on-site burial of rotten corn and expired chemicals. “Despite all of this incriminatory information, the government has announced plans to re-launch the park, and more parks are in the works,” continued Bonketo. The World Bank and the African Development Bank (AfDB) are the key drivers, designers, and financers of agro-industrial parks. They have been at the forefront of promoting a misleading narrative about farmers being backward and agriculture having to evolve to the Western-industrialized model. The Bukanga Lonzo Debacle details the fallacies of this storyline and describes what an effective agricultural policy would look like, drawn from DRC’s own policy. 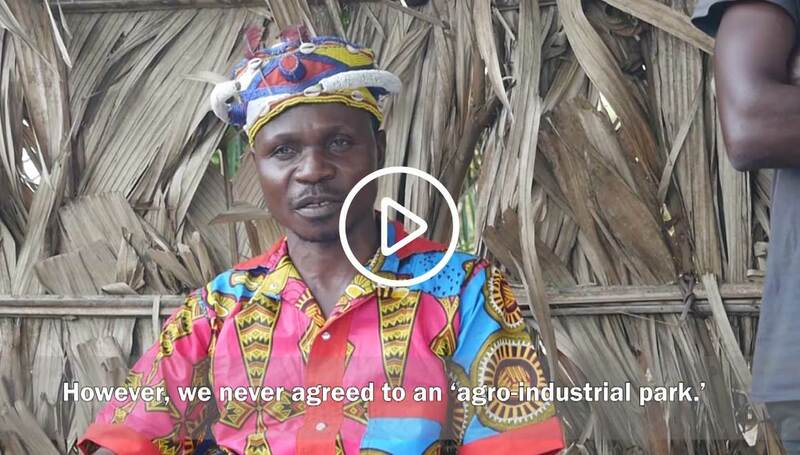 “This is not just about a faulty project – this is about a faulty strategy, designed and funded by the World Bank and the AfDB, that prioritizes industrial agriculture over the rights, well-being, and livelihood of local communities. What’s most shocking is that this plan even goes against the country’s own agricultural policy and the will of farmers and their organizations,” continued Mousseau. The report is based on field research and an in-depth investigation of the project. It urges the government of DRC, along with the World Bank and the AfDB, to learn from the Bukanga Lonzo debacle and give up plans to develop additional agro-industrial parks in the country. 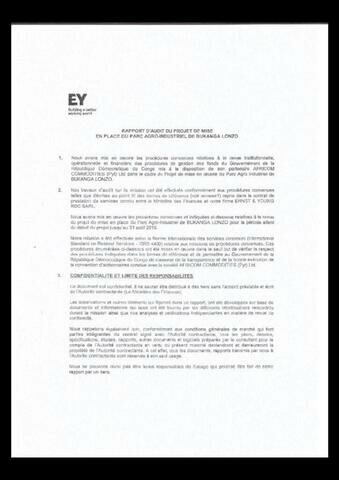 The report and accompanying documentation, including the Compilation of letters and petitions from local communities and their representatives, including copies of the “Act of Engagement” signed by local chiefs, the leaked Ernest & Young audit, and the incorporation documents of the mining company are available here. Incorporation documents of the mining company.